Kfirim Enjoys Last Shabbat Together! The summer is quickly coming to a close, and with it our final blog post. Sticking with the theme of finality and endings, the summer cannot end without a maccabiah (color war). Thursday night was one of the marquee events of the maccabiah, the chidon (quiz show). Each aydah (age group) answered questions they learned in kitah (class). They buzzed in and got points for their team if the answer was correct. Friday night and Saturday, the whole camp had an emotional last Shabbat, as it was Debbie and Joel Sussman’s farewell t our. Debbie gave a powerful speech reflecting on her time at Yavneh before Joel’s beautiful, final recitation of Musaf (additional service on Shabbat morning). Shabbat afternoon turned into Saturday evening, and with it came Tisha B’Av, where we remember all the calamities and tragedies that befell and continue to happen to the Jewish people. Most notably, this was the day where both the Beit Hamikdash (Holy Temple) were destroyed. 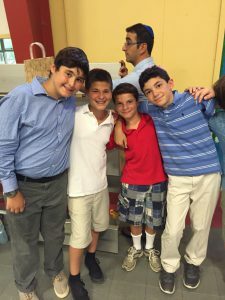 Kfirim reflected on these events through hearing megillat eichah (the scroll of lamentations), playing choose your own adventure stories about the Holocaust and the Spanish Inquisition, and watched a movie about inclusion, Full Court Miracle. After some chanichim (campers) and all madrichim (counselors) broke their fast on glazed salmon, potatoes, green beans, garlic bread, and cheesecake, we all went to sleep looking forward to another fun day. Today, we continued Maccabiah with sports games and a camp relay race. Sammy was particularly fast, and won the race for his team. At night, we had the annual dizzy izzy relay, which was lots of fun. Tomorrow we close Maccabiah with the L’chu Neranenah (Come, Let Us Sing) competition and Wednesday will be the end of Summer banquet. And so, dear readers, our time together has come to a close. We have thoroughly enjoyed our correspondence with you and hope that you have equally valued our updates. Therefore, we bid you adieu, and wish you all a fantastic end to the summer and a shanah tovah (a good year)! L’hitraot (until next time)! Micah and Aliza, signing off!